Just dropping in to let you know I'm guest posting over on the Hart's Fabric blog today in honor of Sew Your Hart Out September! Hart's is one of my very favorite indie fabric stores and I'm so pleased to be able to share their wonderful business with y'all. More posts featuring Hart's Fabric here and here, and take a look at all the the other posts in the blog tour over on Hart's blog here. 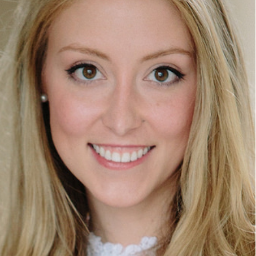 Thank you to Robert Kaufmann for providing the fabric for this project, and thank you for supporting the companies that make this blog possible! Before I get into this coat--I want to admit right off the bat that I totally copied the Deer and Doe sample. I'm a serial vintage-pattern-illustration-copier, and it appears that my affliction has morphed into practically stealing the clothes off the models. Since Camille and I share similar measurements, it's even worse! This is basically the exact. same. trench. The fabric I used (as did Deer & Doe, haha) is a Robert Kaufmann Ventana Twill and it is absolutely perfect for this application! Also, they have this twill in 66 different colors, including hot pink, the prettiest pale yellow ("powder lemon"), a beautiful deep green, and even multiple shades of khaki/stone/beige for you traditionalists. (Plus, a prepared for dying white if you can't find what you are looking for, but again, there are 66 colors. 66.) It was easy to work with and lightweight enough that multiple layers were a breeze, while holding it's shape perfectly in this unlined, mostly-uninterfaced coat. This is a 36 bodice and a 40 skirt, which I cobbled together by deepening the pleats in the skirt. As long as the skirt pleats line up with the princess seams on the bodice, you can swap out whatever size you want! If I make this pattern again, I'll probably size up one in the bodice; the 36 fits but there's no room for a sweater under there, if you truly want a fall/early winter coat! It's also worth noting that this is a very hourglass-shaped pattern: the 36 is designed for a 33" bust, which I do have, and a 25 1/4" waist, which I definitely do not. Although I do already have two other trenches (a neutral burda one and a rtw one in leopard print) I actually do see myself making another version of this in one of those traditional trench colors... it's such a flattering shape (much more so than my burda, which is swingier) and I'd love to draft a gun flap add-on for a extra traditional touch. 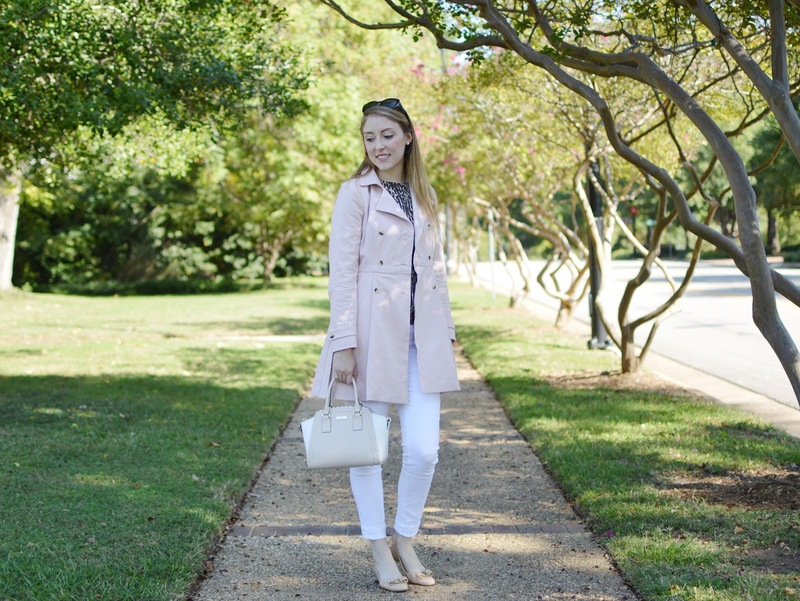 Although my year round love of pink is well-documented on this blog, this coat will be equally appropriate in spring. In fact this was really supposed to be a spring project, but I kept putting it off for one reason: I was scared to make the bound buttonholes! As (almost) always happens, that was really silly of me, and the buttonholes ended up being a breeze using the pattern instructions. I've added a new skill to my work box and I could even imagine myself adding bound buttonholes to patterns that don't call for them in the future... maybe. They add such a luxe touch to this project--and no. one. will think you made it yourself! Honestly, I have nothing but praises for this whole project. 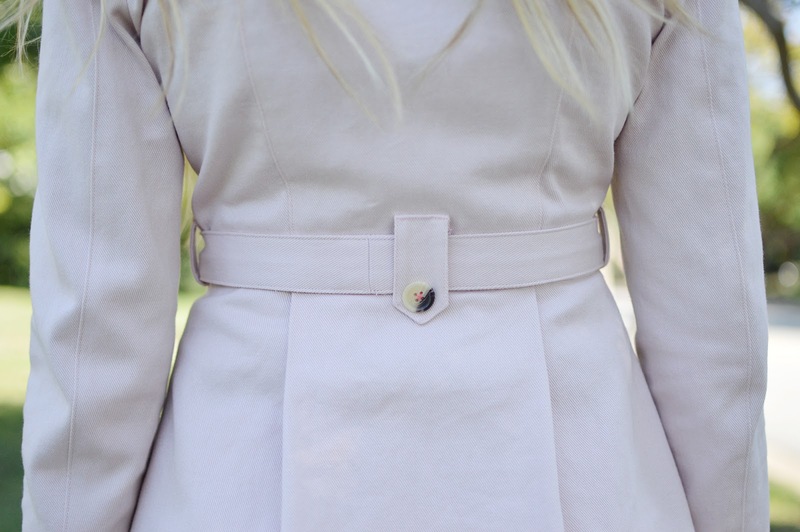 If you followed my construction of this coat over on Instagram stories, you'll already know that I absolutely loved loved loved putting this trench together; Deer and Doe's drafting is flawless, the fit is wonderful, the instructions are comprehensive, and the ventana twill was the exact right choice for the project. I'm gushing, I know, but I loved this project--both the process and the result--and this is officially one of my favorite things I've ever made. I think it will get lots and lots of wear, and I can't wait to make another (maybe next spring?) in another color. If you've been waffling on this pattern, totally get it, and if you have it but don't know what fabric you should make it with... now you know! One last note: my pretty Liberty bias tape was my souvenir from my recent trip to France, purchased at La Droguerie in Strasbourg. Such a pretty little shop, and they have a whole book case full of yards and yards of pretty tape biais and piping! 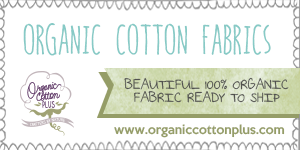 Do you buy fabric or notions or patterns on vacation? Or just me? ps: i also visit libraries everywhere i go. gotta scope that competition!! 1. 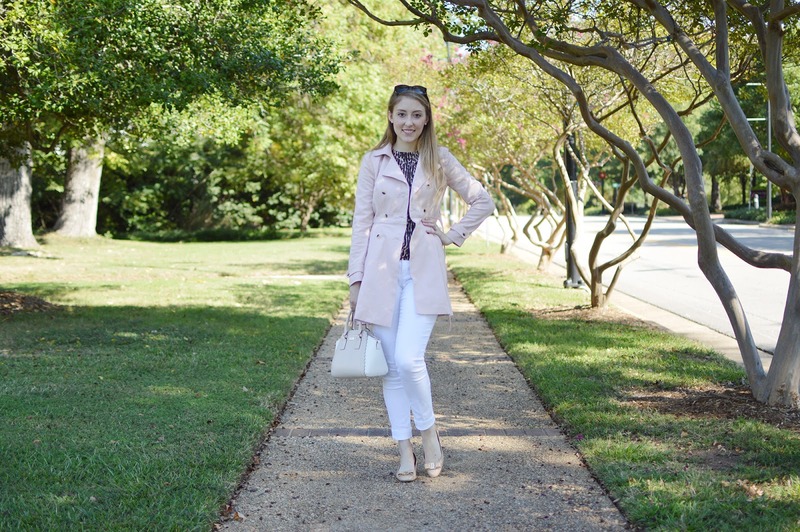 A spring/fall transitional trench. I snapped up the Deer and Doe Luzerne Trench coat immediately after it was released but it took me a while to finally make it--in the same fabric as the sample, oops! 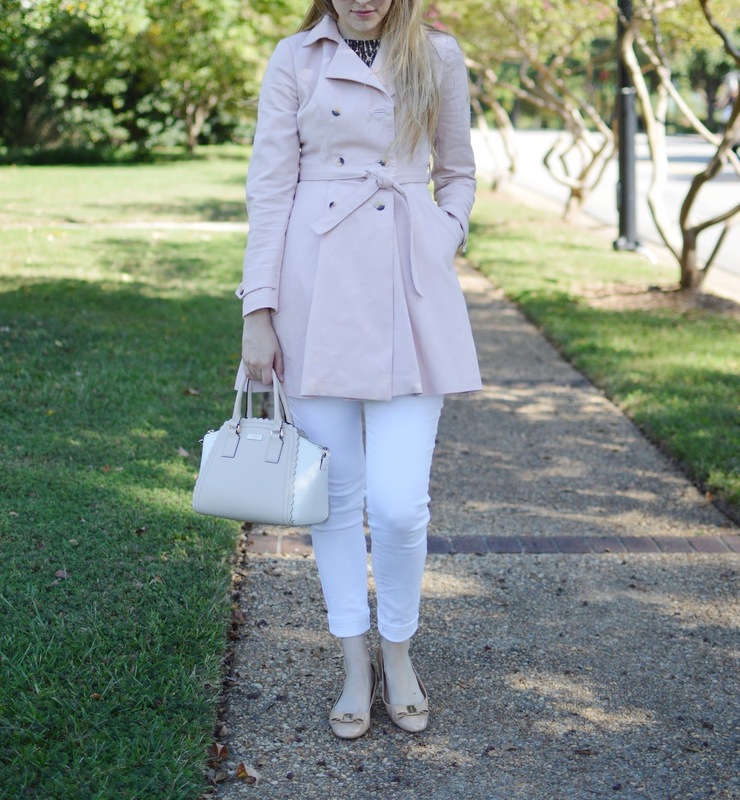 I love blush for fall and this trench was such a pleasure to make. 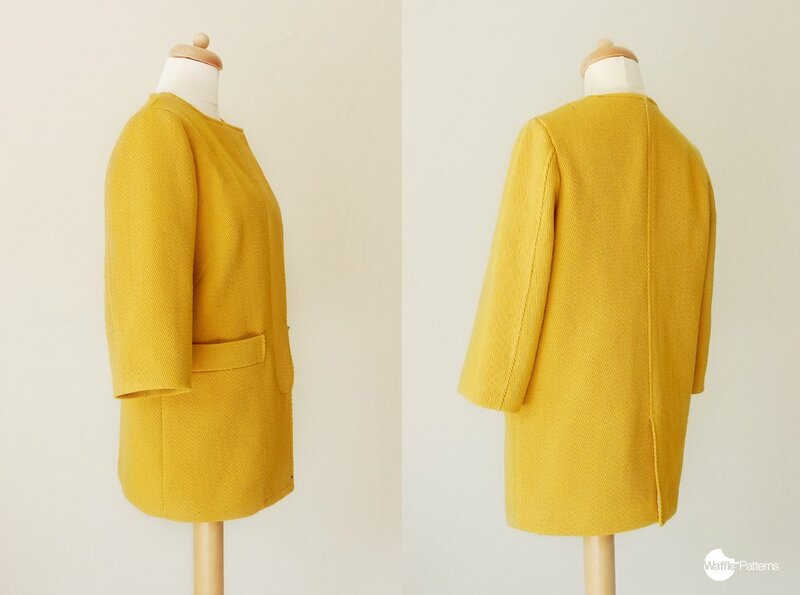 Kicking off my coat making wonderfully, it'll be on the blog Monday! 2. A warm camel coat with a faux fur removable collar. I have all of the fabric and notions for this... I plan on using view 1 of the Waffle Patterns Bamboo Coat, which is an absolutely gorgeous pattern. I'm surprised I haven't seen tons of them, but perhaps that will change this year? I hope so! I want to add a self-fabric tie belt to nip in the waist and a removable faux fur collar in homage to my favorite 60s Lilli Ann coats. 3. 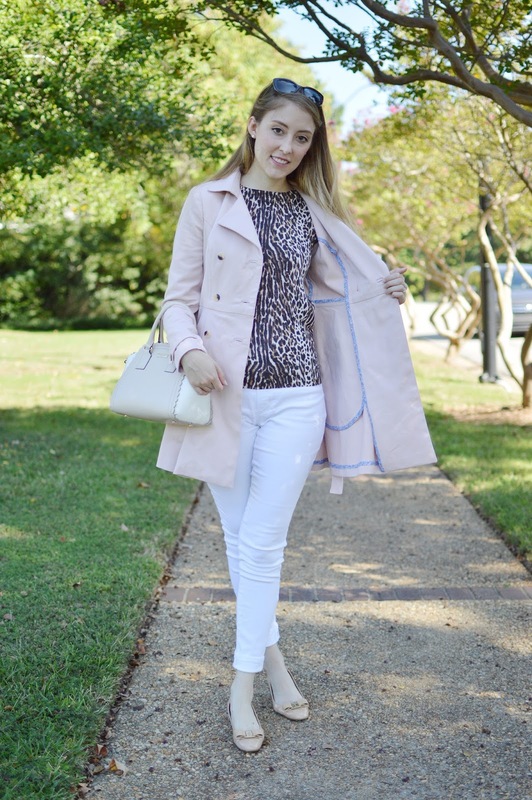 A streamlined coat in a fun color. Two years ago(!) 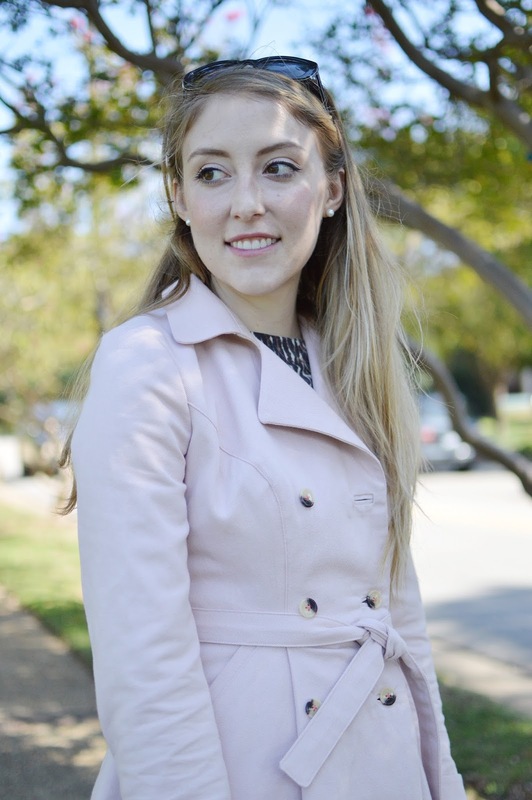 I made my pink bow coat and I want to make another coat with the same type of feel--just a super cute, simple coat in a pretty fabric. View 2 of the Bamboo is perfect--shorter, with bracelet-length sleeves and a collarless neckline--so I'll use the same pattern here, too, and use it to practice the trickier sections of that pattern: the lined vent and the hidden button placket. I love the yellow they used in the sample, but I don't think quite that much yellow will do me favors, so I'm still looking for the perfect fabric for this coat. Any suggestions? 6. 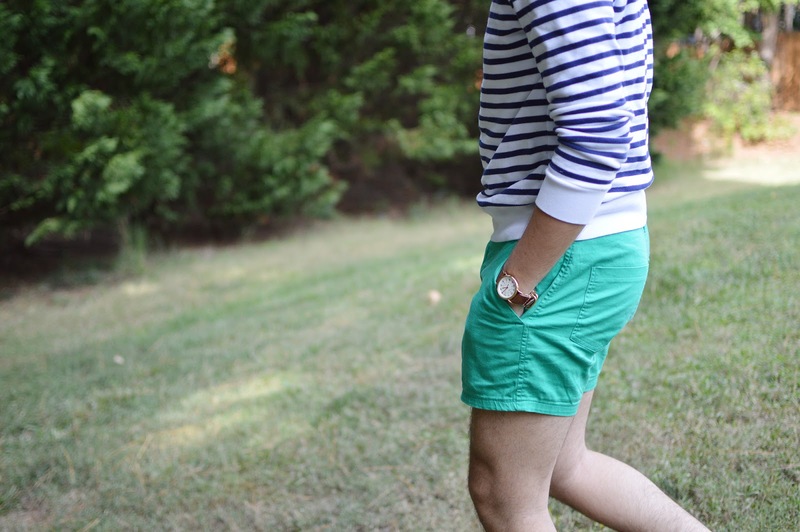 A navy blazer. I guess I'll just keeping putting this on fall lists year after year until I actually do it. 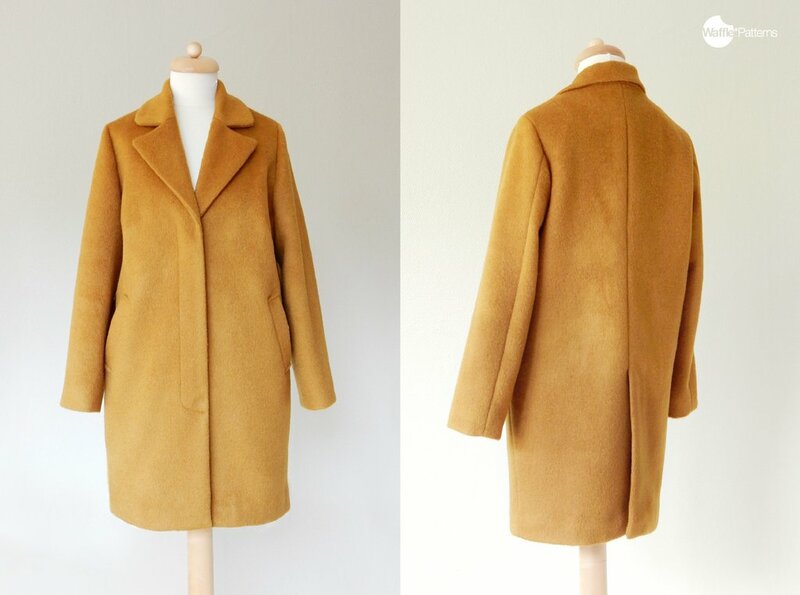 If I can dip my toes into hand tailoring for my camel coat, hopefully I'll feel confident enough to tackle a blazer? I'm not sure why this seems like such a scary project! And what else will I be making besides coats, coats, coats? I actually want to boost my knits skills a bit as well and make a few waterfall tees since I like my first one so much, and maybe a few other simple tops? I'm sure a dress or two will sneak in as well... What do you have planned for fall (or spring if you're in the southern hemisphere!)? Something ambitious? Something fun? A bit of both? ps: really it's only 4 patterns though so this is a littttle bit more feasible than it may appear. maybe. Thank you to Indiesew for providing this pattern. 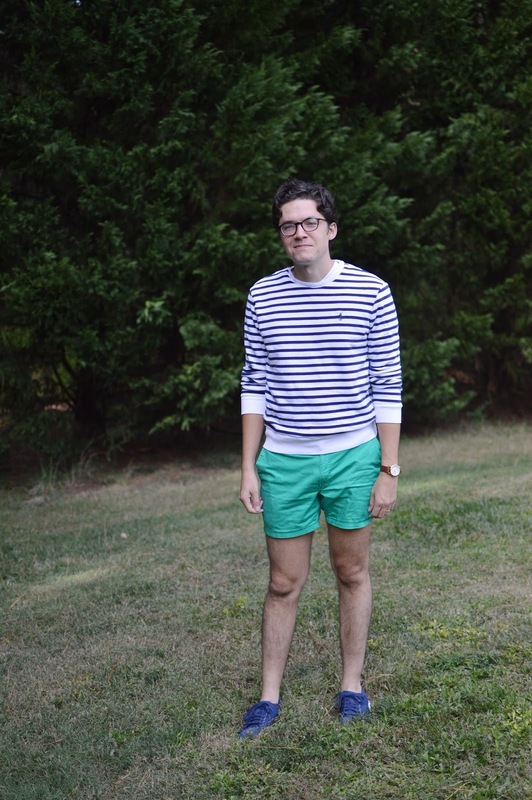 I am not known for a prolific production of knits, in fact I think the knit garments on this blog number in the single digits, but my mom sews tons of knit garments and occasionally I get jealous and decide I want to wear something stretchy and comfortable too. That was the impulse behind this simple top--I've had this pattern for ages but was never inspired to make it until I saw my mom's adorable versions that she packed for our vacation a few weeks ago! She made 3 or 4 Charleston dresses with different sleeve lengths and prints and had a whole wardrobe of Charlestons to wear! That's the beauty of this pattern, that it has so many different options to mix and match: two different skirt views (slim and a-line) and seven different sleeve options (elbow, 3/4, and long lengths, a gathered cap sleeve, and two little shoulder details I'm not sure how to explain, as well as plain sleeveless). A small detail of this pattern I can't neglect to mention is that the bodice comes with two slightly different drafts, one designed for sleeves and one for sleeveless. I really appreciate this of attention to detail--thanks Hey June! It does mean that there are lots of pattern pieces to print and tape, but I think this pattern is so versatile that all the taping and tracing is worth it--you can really use it again and again for all different looks. Of course, I decided that even given the multitude of versions available, I would go off-piste and make up a new one, because that is what I do. 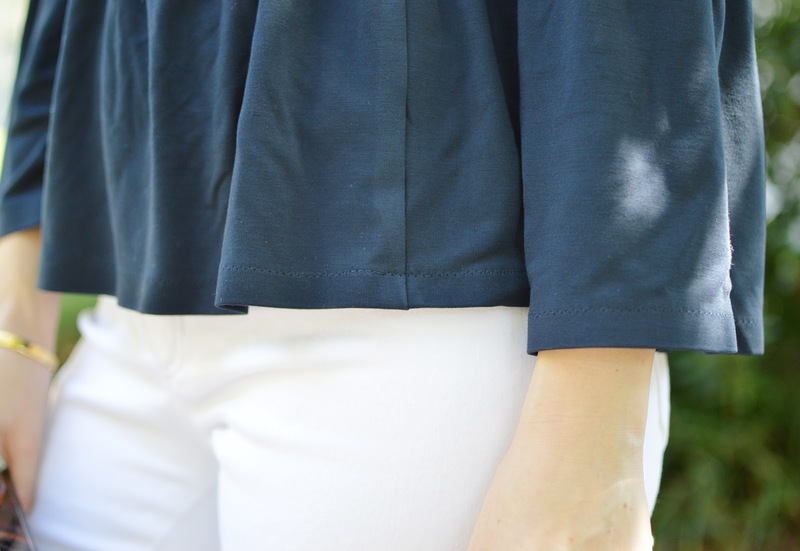 In honor of #yearofthesleeve I went with some pretty bell sleeves, made using the elbow-length sleeve pattern and simply gathering a rectangle to the end instead of hemming. Looking back, I should have actually based the length of the rectangle on the length of the long sleeve, because my sleeves ended up a little bit more bracelet-length than I intended! 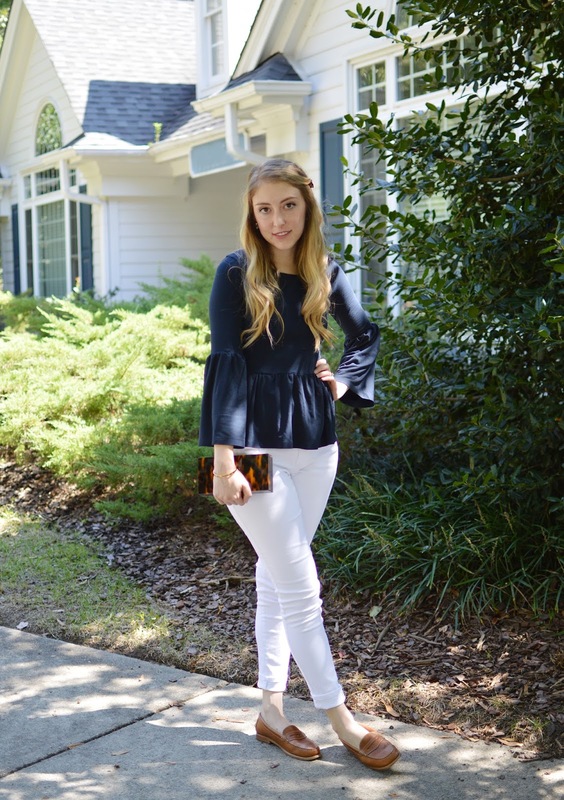 The peplum is made in the same way--I love how the peplum and the bell sleeves look together, and since the rayon knit I used is pretty drapey, it doesn't add too much bulk. 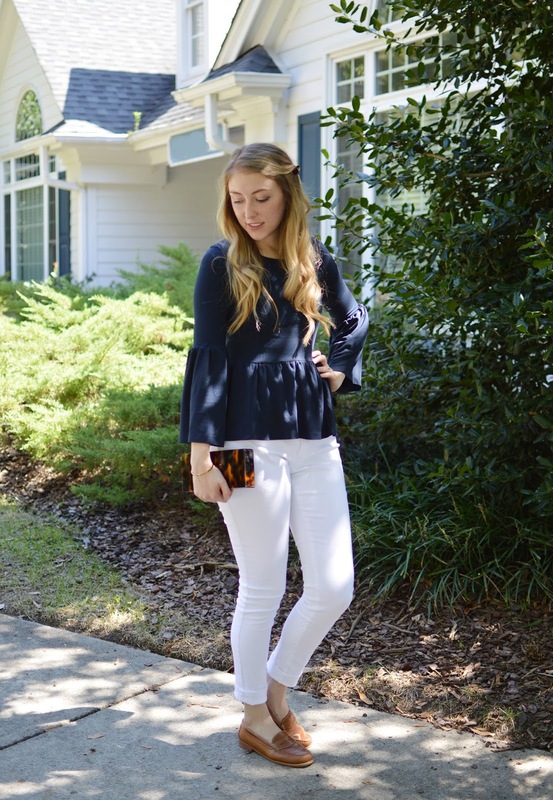 I totally feel like I'm channeling Lara, queen of dressy-casual knit tops, white jeans, and lots of navy! 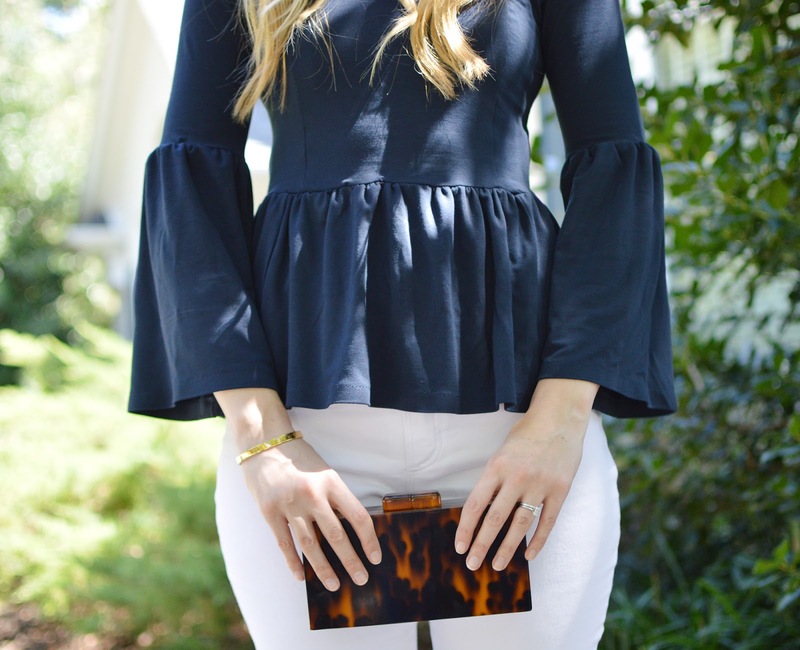 If you look closely, however, you'll notice this shirt isn't perfect; in addition to the sleeves being slightly short, my gathering is pretty uneven and there are a few puckers here and there. It's not too noticeable when worn, but I had a lot of trouble with my serger during this project, and actually finished it on my regular sewing machine instead. The guts of this top remind me of the insides of my first woven sewing projects, with uneven, unfinished seam allowances and some pretty awkward sewing. I did try something new though--I used fusible tape to stabilize my hemming on peplum and sleeves! Several of you suggested I try this and it really does make a huge difference--it was so, so much easier to hem the taped up hems. Now I just need tips on how to make all the other steps as easy! 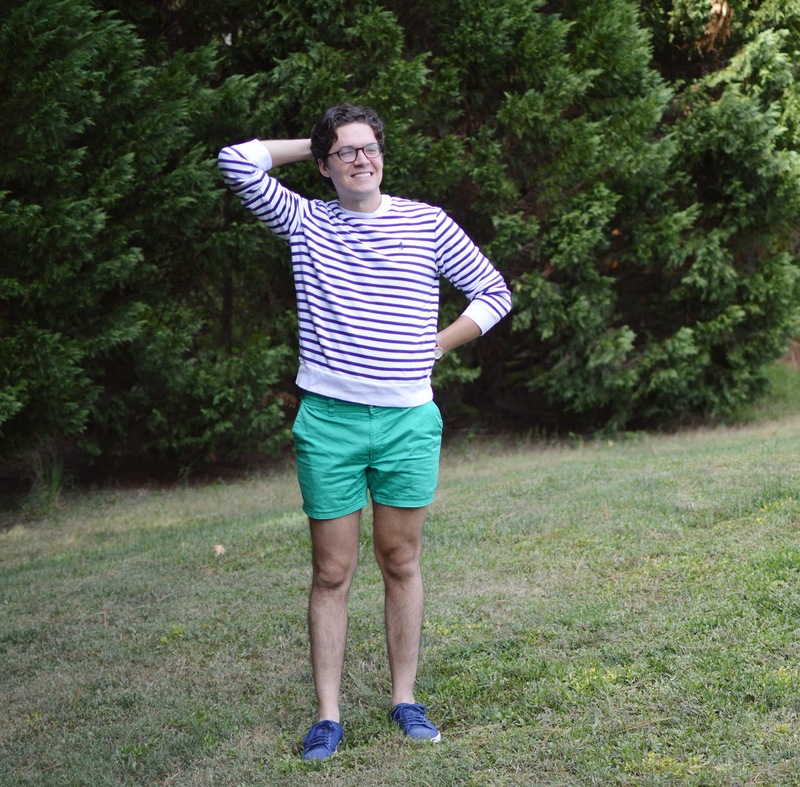 Do you prefer sewing knits or wovens? I find knits to be endlessly frustrating to me, but then again it's sort of nice to be back as a "beginner" and be learning a bunch of new skills at once instead of obsessing over perfection in bound buttonholes or whatever. ps: Lara has also made a really cute charleston dress as part of her goal to sew the whole Indiesew S/S 2017 collection! i think this is such a cute idea--after all, Allie designs the collections to work together so it's like a little mini capsule wardrobe! I've stuck Alex in front of the camera today instead of behind because I am sick sick sick! Back to regularly scheduled content aka dresses soon. 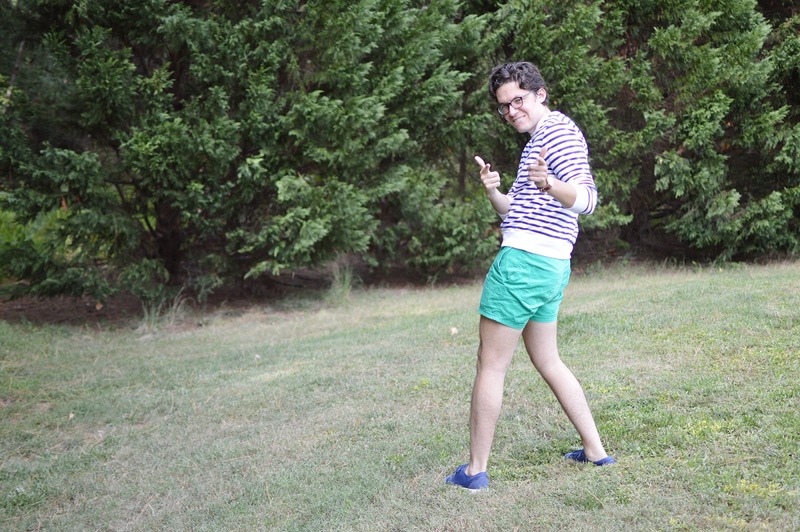 Two years ago I made Alex a pair of elastic-waist corduroy short shorts--and tackled my first fly front ever! After having made myself a few pairs of pants and feeling pretty comfortable with fly zippers, I figured it was time to revisit the pattern and make another pair. These have a pretty different look in this kelly green cotton sateen (received in a Sew Conscious box and so not my color, but matches Alex's wardrobe perfectly) than they do in grey corduroy, but the only change I made from the first to the second pair was to only elasticate the back waistband in this second pair where the entire waistband is elasticated in the first pair (and the original inspiration, chubbies). 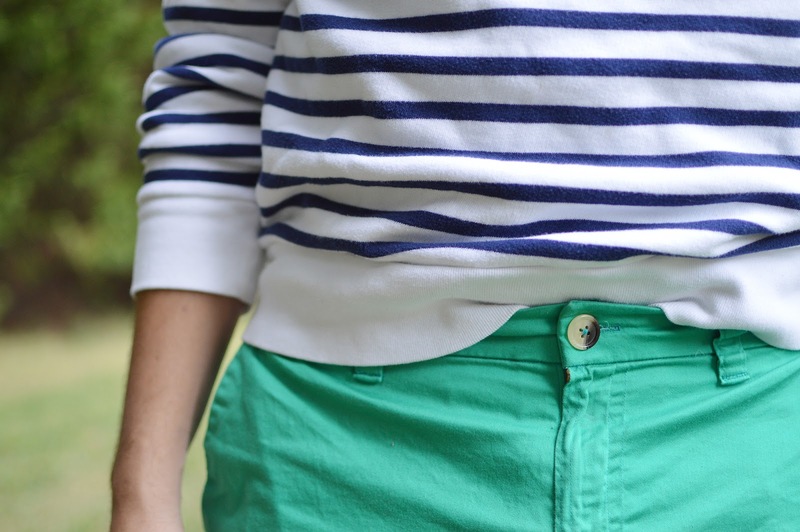 Although I still struggled with the fly zip and ended up using my HG zip instructions from the Ginger Jeans, I could really tell my sewing has improved since making the last pair--they went together quicker, I felt more confident, and the overall look is much more polished. The corduroy pair, you'll notice, doesn't have belt loops or back pockets, because they seemed scary to me, so I skipped them! 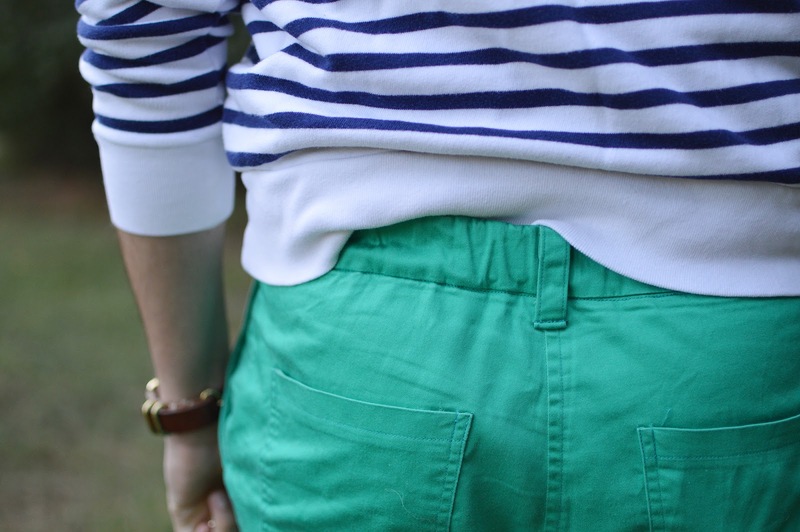 (My Birkin Flares also have no belt loops.) This pair I did belt loops and back pockets and everything... and for the next pair I am even going to do welt pockets. Promise. 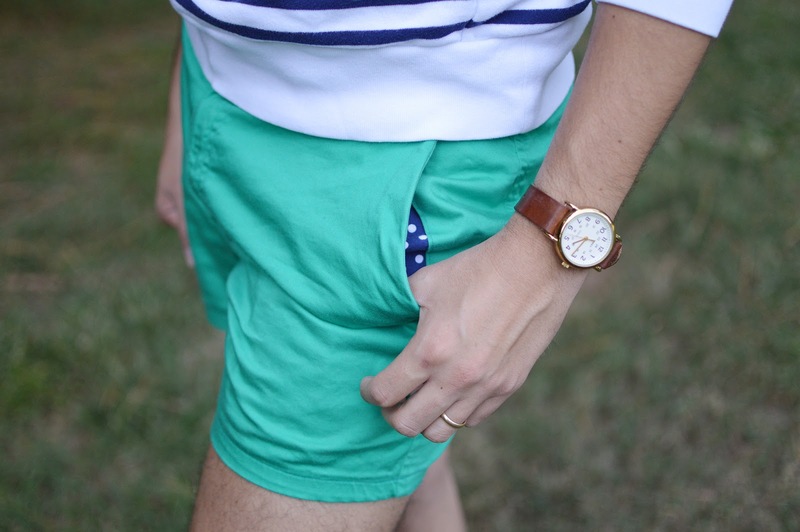 ps: doesn't his watch (first seen here) look so nice? it has aged beautifully since my mom first made it--she almost didn't even recognize it when she saw it last! CHI and Bed Bath & Beyond provided this iron for review but opinions and thoughts are all mine. 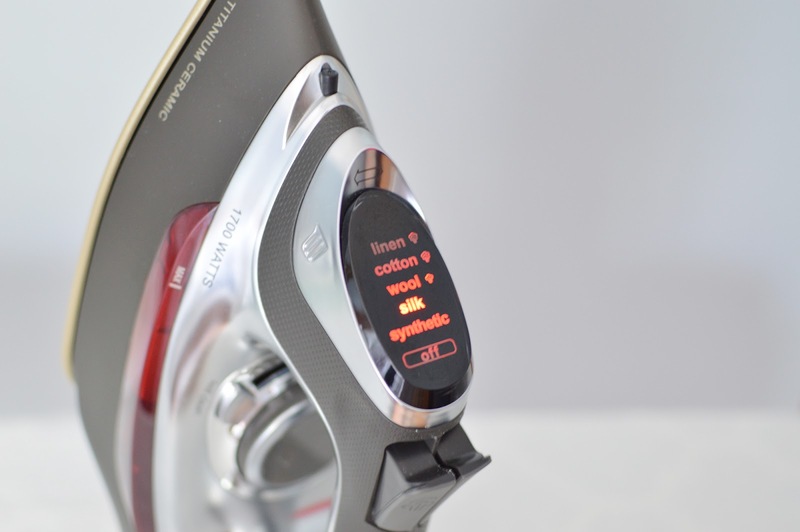 CHI recently sent me their Electronic Iron with Retractable Cord to review. I was happy to accept considering my last iron (pictured for comparison) was a cheapy one from Target that I dropped on the floor and broke a chunk off of about 3 years ago... Basically any iron would be better than that one, but I've had this iron for a few weeks now and used it on everything from wool coating to cotton sateen to rayon lawn to handkerchief linen, and I'm happy to report I really love it! If you are familiar with CHI, it's probably because of their hair straighteners, which I actually straightened my hair with for these very photos! They really are the best for silky straight hair. 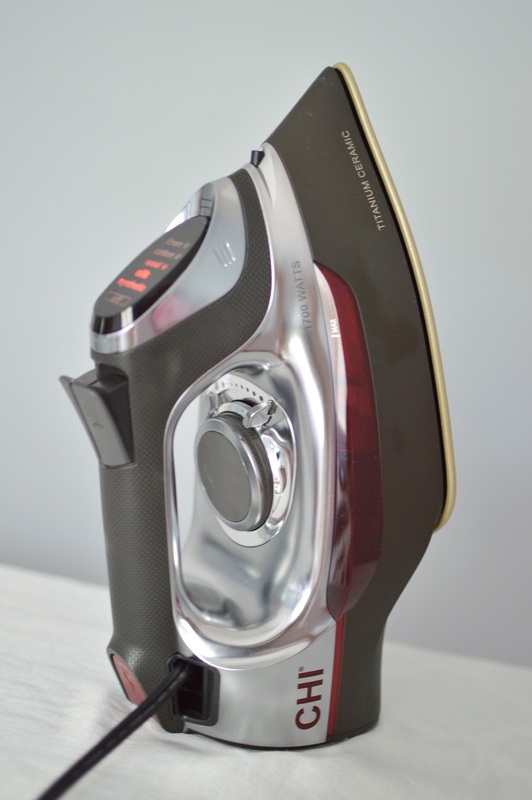 My mom told me she used to iron her hair with the clothes iron in the 70s before hair straighteners, and CHI is sort of doing the same thing, but backwards--they've adapted the same ceramic titanium plate technology to their new household irons. 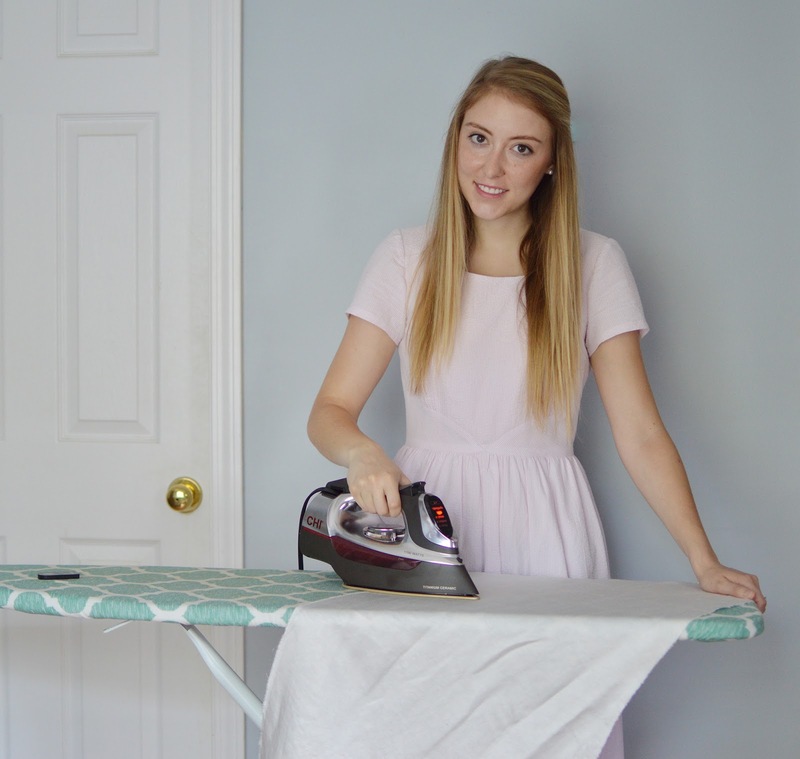 The same way the ceramic-coated paddles of their hair straighteners glides over hair, this iron really glides over fabric--it's non-stick and non-static. It also creates an amazing amount of steam! I steam-pressed three yards of wool using this iron and it took no time at all thanks to the large water receptacle and 400 steam holes. It has settings for synthetics, silk, wool, cotton, and linen, a retractable cord, and an automatic off. I really like the shape of the plate, which has a pointy "nose" that is nice when pressing seams flat and getting into tight corners. One thing that I never thought about with my previous irons, but have grown to really appreciate in this one, is the sound alert. 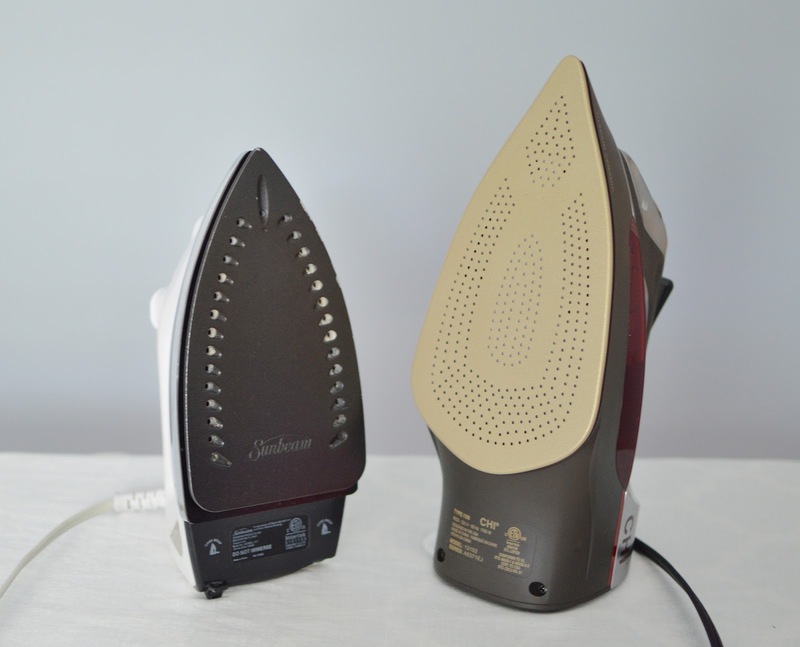 As opposed to my old iron, which blinked when it was heating up or had turned itself off, and had a steady light when on and fully heated, the CHI iron makes a pleasant beeping noise when it has fully heated up and when it is going into standby/safety mode. I really like this more than I thought I would, since it lets me know when I'm ready to press even if I'm sitting at my machine, not paying attention to my ironing board. Along with all those pros, my only sort-of con: this iron is big and gets heavy! Because of the large water container and retractable cord (you can see the opening for the cord in the last picture), the base of the iron is large. If you like to fill your iron directly from the tap like I do, know that this iron barely fits under the faucet in my bathroom sink. When the water receptacle is filled, this iron weighs a lot, but then again, isn't that sort of what an iron is supposed to do? For me, the many pros (great steam, sound notifications, big plate, smooth gliding surface) totally outweigh this small inconvenience. 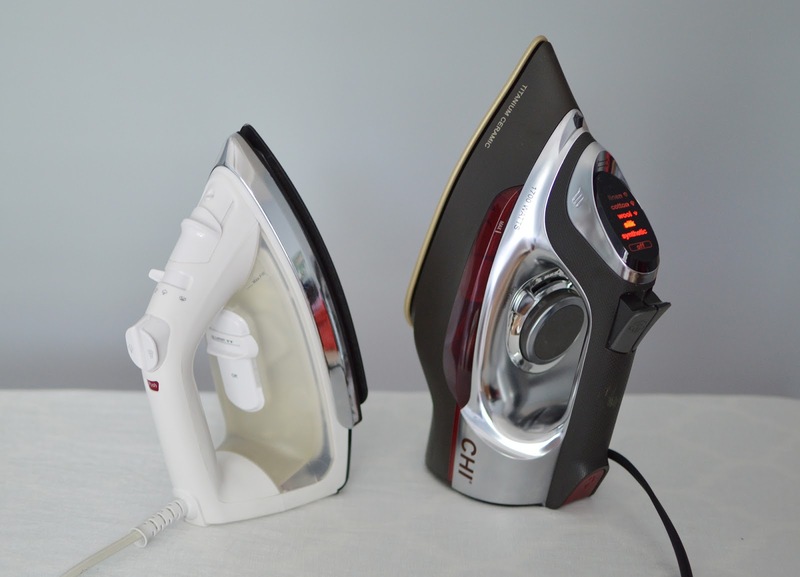 Do you love your iron or is it more of a love/hate relationship? If you are feeling like an upgrade, you can find this iron at Bed Bath & Beyond for $99 with free shipping. ps: lets be real though, we both know you get a bb&b coupon in your mailbox once a week. I'm traveling as you read this post, so just a simple little project today! I'm currently en route between Kaysersberg and Zurich but these photos (totally unedited since I'm posting this using my brother's laptop which he lent to me for 5 minutes only and keep it plugged in so I have power to watch Battlestar Galactica!, sorry!) were taken in Strasbourg--I climbed all the way to the top of that church (Notre Dame de Strasbourg) despite my fear of heights--my whole body was trembling by the time we reached the top! Last year, I made a pretty blue seersucker dress and ended up with one long strip of seersucker left over, that I made into the ruffle of an off-the-shoulder top, the rest of the top being white cotton. It didn't end up looking how I envisioned it, but at that point I was convinced I needed a blue seersucker off-the-shoulder-top, so I ordered a bit more of the original fabric and made a little dress! Usually I wear it with a slim leather belt but today I paired it with the bow from my original blue seersucker dress since I had it on hand and since it coordinates, might as well, right? This is the easiest/best way to make a dress like this--you really don't need a pattern, you just use a bunch of rectangles in different sizes and a piece of elastic, no zippers or anything! I used it last summer to make my black eyelet dress (which I lovvvve) and this is made in the same way, just with an extra ruffle on the bottom (and a white cotton voile underlining). The bottom ruffle is the original strip left over from the first project, and it worked out that it is just about twice as wide as the hem of the dress, so if you want a similar ruffle on your version of Megan Nielsen's tutorial, just cut your dress a bit shorter and then cut a ruffle twice as long as the dress and as long as the amount you shortened the dress by (plus 1 1/4 inches for seam allowances) to gather and attach at the bottom. That way your dress ends up the same length and your ruffle is nice and full. I have a nice collection of seersucker dresses at this point--I'm envisioning one more, in yellow, and I'm thinking of using this pretty vintage pattern (the view with the ruffles). 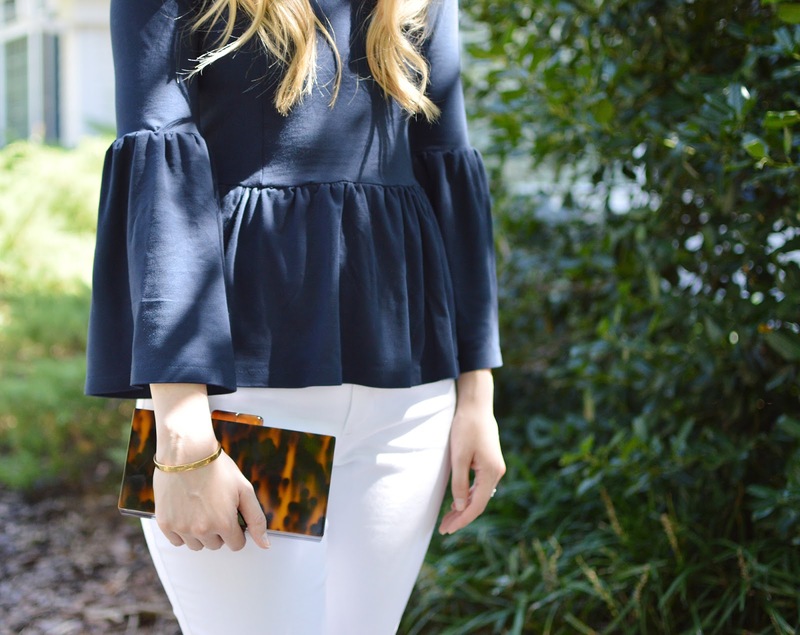 No such thing as too much seersucker, and no such thing as too many ruffles, don't you agree? ps: i hope these past couple of weeks have been pretty seamless--maintaining a blog while traveling is tricky but i think i got it figured out for the most part!